the current stage of the Fedora 25 Supplemental Wallpaper.. Start of this month I openend the submission phase for the Fedora Supplemental Wallpaper. So far we have received 91 submissions and currently 72 of them are approved. So far 49 contributors earned a badge for their submission. But there is still time until 11. October left to contribute a wallpaper. No event report – No badge! 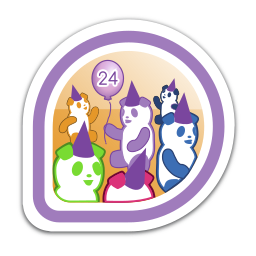 Some was triggering me during this week, to get the badge for the Release Party for Fedora 24 awarded. But looking to the wikipage I find not a lot reports, even when I look at the event pages I dont find them. On some I only find pictures, well it seems I am expected to know everybody of Fedora by face. So if you want something bring something, if you expect to get the badge awarded, link your event report on the wiki pages! Durng the weekend of 28th to 31st of July I was in Westford for the Design Team FAD, which we had now for the second time and we use mainly for organizing the work in the team. We all arrived during the week, but we are much lesser then last year, as some flights are more expensive like mine. So we are just 7 people this year. Day one we spending most of the time with preparing for the open badges hackfest which we will held tomorrow. So we prepared some Inkscape lessons for an entry to Inkscape. The rest of the day we was spending time for organizational stuff we have to do for the work with the Design Team. We organized during the FAD 2015 the work of the Design Team new, we have since then regular meetings in IRC where we look over our ticket queue. Since we doing that, we handle all tickets very fast and our ticket queue is always in short time solved. But that creates another problem, we never have tickets for newcomers left, so we have to find a solution for that. The other problem we have with that is, that we concentrating to much on the tickets and the design for the distribution itself does not end up there, so we sometimes loosing track of it. With the meeting we have to find a solution for it as a bigger part of the Design team is now living in APAC, like Ryan Lerch and me. So its very difficult for us joining the regular meeting. We also spent time organizing the migration of our ticket system to Pagure, which will be happen soon. The migration from trac to Pagure is for the Design Team and the Badges a little bit more problematic as we need some features to do so. It looks we will switch to such one, as we have to to save some money as still a lot of Asians want to travel to Flock. But the FUDCon is still needed in the region for grow our amount of contributors there and connect the region better together. For 2017 are no bids so far, maybe there coming some up. But starting with 2018 we might have FUDCon only each second year. After reviewing the current budget and some discussions about the problems of the region, day 1 of the FAD ended and it followed a journey with trains to Izhars house where his mother had prepared a dinner for us, because there was Hari Raya Aidilfitri, so we could enjoy some local specialities. Was good for me, I love beef redang anyway and the malaysian version is also good. The second day was filled with discussions for the budget for next year. There is not much room after the cut, so most of the events dont get budget anymore, just two main events get a larger part, the rest floats into release parties, a few smaller events and the swag production. Unfortunately we had for the second day only until the late afternoon as some was already flying home then. I did fly back next morning to arrive right in time in the office, just that the flight was delayed and I came a little bit later as planned. As a conclusion, we still have extreme problems in this region. The Ambassadors think not as Fedorians of the region as just on their own needs first. There is still a huge gap between, what is done and what is reported. Not to speak about missing invoices and carelessness with the reimbursements. A few days ago, the voting for the Supplemental Wallpaper for Fedora 24 opened. And I am impressed, how many Fedora contributors have voted so far, but I have to tell you that even I dont know the exact number yet. Nuancier is written in a way, that I cant look into the numbers before it is published. But Fedora Badges gives a little bit of an insight, but you have to see as we made that badge for the first time there was a lot of discussion about badges for voting, so it must be claimed manually and its not claimed by all who vote. But now we have already 207 badges for Fedora 24 claimed, compared to 89 for Fedora 23. So the amount of voters is already doubled and there is still nearly a week time for the votes! Personally I am impressed and happy to see that lot of interest in this part of Fedora. For me is the Supplemental Wallpaper Contest a so called low hanging fruit, which make it very easy possible to contribute to Fedora. The first step from consumer to contributor is by far the hardest and if this step is done, it becomes way easier to do more. I thinking since a long time to open the voting also to people who have not cla/fpca +1 membership. That would be from my perspective a necessary step, but I always have the fear for the quality. We reached a level of quality now, which is good but still our own contributors have a strong faible for blue, the rather would vote for an halfway acceptable blue wallpaper instead of an amazing shot of an bird. We already installed a weight system for the voting, members of the Fedora Design Team have an higher weight with there vote and there is also the group of Nuancier Mentors, who have also more weight for their vote. Originally the Nuancier Mentors was thought as a group who continuously contributed to the Supplemental Wallpaper Contest, to get them mostly out of the problem not to be allowed to vote by themselves. That´s a bit chicken-egg problem with this ¨low hanging fruit¨” you also can scare contributors them off with this. The Nuancier Mentors group was also thought for giving them more responsibility and improve the quality of the submissions. But its not that far implemented as I would like, as Nuancier is simple a sideshow. There is still the feature for the multi-monitor wallpaper, which is not implemented yet but ready to do so. There are also some needed features, I had this time a bit of trouble to moderate the last submissions. There are four submissions this time, who could not been moderated as I have to do for all a legal research (I had to reject this time 3 for violations, people are not aware they cant submit everything). So I need a small time between the end of submission phase and voting phase, thats right now not possible as it opens automatically and I also might need some time after the election. But there are other things, who could be helpful improving the Contest. First of all we have way to many wallpaper packages, people always asking how to install them. The nicest thing to do would be to deliver them by default, replace the GNOME (and also on the other DEs) extra ones. That would be the nicest thing to do. That would make the wallpaper really prominent and might animate more to contribute in higher quality. As the Nuancier Mentors group was thought for increasing the quality of the wallpaper through giving hints what could be improved with an submission that requires tiny changes in what can be submitted. Its lesser possible then to submit the work of somebody else (that would decrease the amount of legal research I have to do) as changes might require the source. But Nuancier has to be change to submit versions of a submission. And that requires some work. There is the problem with acceptance/moderation to solve then. But I think that kind of moderation can be done then by the mentors. So there is a way how to do it to find and it must be implemented. Open the voting for everybody with an FAS account. I think that can be done for Fedora 25, to secure the quality, we could change the weight system a bit more, so that Fedora contributors have a higher value in vote to prevent fake-accounts and cheating votes. I really would like to open it, lets see if we can do for F25. But all requires some work and I am sure Pingou would be happy to get some help in implementing new features for Nuancier. But its open anyway, you can find the source code here. Its more then a month ago, that I opened the Contest for finding the Supplemental Wallpaper for Fedora 24. Its time to give a little inside view and current score, what is going on. So far we have 99 submissions, and 97 are valid. 53 badges for contributions are handed out, but a lot of contributors have no badges account, and the most of them are fresh contributors. But there is still time for submissions, until 11th of April. So go make your contribution, if you not have done it yet! As one of the points we had to revive the Phnom Penh Linux User Group again, was to really do activities on Software-, Hardware- and Document Freedom Day and coming to a regularly meeting, which we have now each first Tuesday in the month at the iCafe. As it is the time for Document Freedom Day (DFD) we will have at our next meeting of course, a topic that fits to it. I will be showing how easily it can be done to use Inkscape for presentation slides, to bring the people to use this instead of flash, pdf or more evil prezi. To win new users and later on new contributors, you have to go locally and that means also to translate Fedora to the local language. For Cambodia and his language khmer we had no translation since Fedora Core 6. We planned since last year to re-initiate the translation for this language, it took as some time to arrange everything, getting the mailing list setup, making the wiki pages and so on. Now we had the time to organize a Translation Sprint to find new contributors and start the translation for khmer running. That is harder as it sounds the biggest problem here in Cambodia is, that Saturday is a normal working day and students have to go to university and others to work. So its not to easy to find enough people for the whole weekend. During the week is also not better, normal students go here at daytime to work and in the evening until 10pm to university or they have university in the morning and go for work in the evening. But we interested enough people to start the translation to khmer, and we will do another such sprint to find more people and driving the translation process forward. This time we was 5 people for translation, we started with an introduction to Fedora as an project and did all necessary steps creating FAS accounts, making personal wiki pages and so on. Later we introduced to how software is translated and how the translation in Fedora works and made the first steps in zanata. After the lunch we could start with translation. We started with main for the translation and reached on sunday evening a translation of 7.04% of this, that is a lot but there is still more to do. A big thank you goes here to Kuylim Tith who translated like an berserker and was already there at 8am in the morning on Sunday and on both days he stopped not before half past 6pm. Its nice to have you in the Khmer Translation Team – bong. On Sunday we had an short hangout with the at the same time ongoing G11N FAD in Tokio to share our experiences with translating Fedora and what can be done to move on with the translation. All in all we moved a good step forward for translating Fedora to khmer. We broke this time nearly all records since we doing the Supplemental Wallpaper Contest with Nuancier. We had 199 submissions, where actually 157 ended up in the pot for the elections. These came from 73 submitters, a lot of them new contributors. Unfortunately we also broke the record for rejected submissions. The most of them contained a trademarked logo, notice that includes our own also! One thing was also more negative, a lot of participants uploaded, not just 3 pictures as many more. Some of them submitted a lot and mostly iterations. That leads to a problem, the Fedora community shows a strong love for “blue”, means if somebody submitting just iterations of a blue pattern, he has a good chance. But it can be that all of his iterations are elected, instead of other better submissions with higher quality. So, with the next contest, we have to limit to amount of submissions that can be made. Hopefully we can implement also some other features to.